The three dollar gold coin, introduced in 1854, was one of the most unpopular coins in history. Both Congress and the Mint were certain a three dollar gold piece would be a high demand item primarily to purchase sheets of 100 three-cent postage stamps. A similar thought process led to the origination of the three cent trime in 1851. Instead, the three dollar gold coin was soundly rejected by the public. Accordingly, small mintages of the coin were produced during its 35 year lifespan from 1854 to 1889. Only about half a million pieces were struck at all the mints combined. Subtract from this total those that were lost or destroyed, and what remains is a tiny supply of three dollar gold coins in existence today. Mint Engraver James Longacre’s design depicts an Indian princess on the obverse, wearing a feathered headdress and a band inscribed with the word “LIBERTY”. An agricultural wreath comprised of tobacco, wheat, corn, and cotton is the primary element of the reverse, encircling the date and “3 DOLLARS” to indicate its face value. 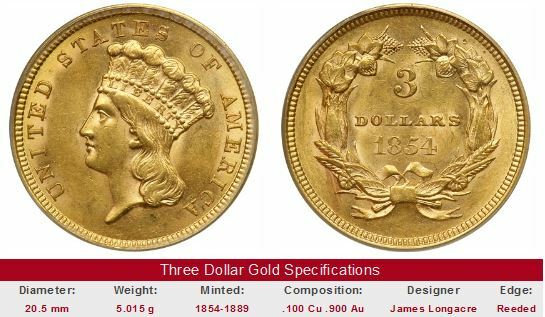 The year 1889 sounded the final death knell for the three dollar gold coin. The one dollar gold coin and the three cent nickel also met their demise in 1889. 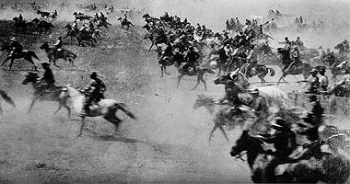 The Oklahoma Land Rush began at noon on April 22, 1889. More than 200,000 homesteaders made a mad dash to stake their claims. A few of the land-hungry settlers crossed the starting line too soon, and are forever remembered as the Oklahoma "Sooners". The year 1889 also saw the end of several United States coin types: the three cent trime, the one dollar gold coin, and the three dollar gold coin. All three dollar gold coin dates are scarce, to say the least. Several of them are famously rare. There is only one known example of the 1870-S, although numismatic scholars believe two of them were struck. The lone known 1870-S went to a new owner in 1982 at a price of $687,500. The 1854-D, 1875, and 1876 are all very rare and merit six figure price tags for high grade examples. There is no such thing as a common date three dollar gold piece; by default, they are all key dates. However, some of them are more key than others. We’ve assigned each coin of the series into one of three groups: Group 1 is the least rare, Group 2 has coins of intermediate scarcity, and Group 3 has the rarest and hence most valuable coins of all (the 1870-S notwithstanding). As one might predict, the coins in Group 1 have demonstrated the least spectacular value trends over time, while those in Group 3 have increased in price the fastest, no doubt due to collectors competing fiercely over an extremely limited supply. The three dollar gold piece has a well deserved reputation for rarity across the board. Unfortunately, scammers have capitalized on this fact over the years by selling overgraded, fake, or altered examples to uninformed buyers anxious to claim an example as their own. If you're buying from a coin dealer with an impeccable reputation amongst the numismatic community, you needn't worry so much. For any other seller, be sure the coin has been certified by one of the four leading grading service companies: PCGS, NGC, ICG, or ANACS. The first "Sales Box" below initiates a search of eBay coin auctions for all Group 1 three dollar gold coins, as defined above. The second and third boxes pulls up Group 2 and Group 3 coins, respectively. There will almost always be several Group 1 coins for sale. This statement does not hold true for Groups 2 and 3 because of their greater scarcity. Lots of people sell coins on eBay, so if you keep checking back, sooner or later you're bound to find a real screamer. Be sure to follow the advice about buying and third party certification. Long range value trends for the 1857 three dollar gold piece are reported on the left hand side of the Group 1 box below. The 1857 was highlighted because it is a good representation of the coins in Group 1. The percent annual increase since 1950 is computed for so you will know how Group 1 does compared to the other groups. Similarly, the 1881 was chosen to illustrate Group 2 trends, and the 1854-D carries the banner of Group 3. By clicking the link on the right hand side of the Sales Box, all coins currently for sale on eBay that belong to that group will be isolated for your convenience.